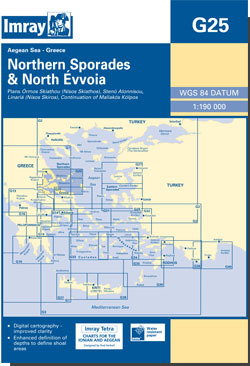 The northern Sporades islands and northern Evvoia (Euboea). Scale: 1 : 183,800. Larger scale plans of Linaria (Skiros), Ormos Skiathou (Skiathos), and Ormos Skopelou (Skopelos). 2009 EDITION - Now digitally-drawn for improved clarity and enhanced definition. Extensive rescheming of inset plans from last edition.